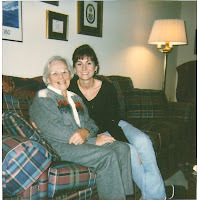 This is a photo of my grandma and I taken several years ago. She recently passed away and I miss her dearly. She was one sweet cookie. She always had a friendly smile and never met a stranger. Happy Mother's Day Carrie! thanks for sharing and celebrating your grandma. i miss mine dearly. I can relate to how you feel. Grandmas are wonderful! I still have my granny and I really don't look forward to losing her. She raised me the first years of my life and I still talk to her almost everyday. This is a wonderful picture. I am sorry she recently passed away, luckily you have a picture like this to remember her by. Wonderful pic. I miss my grandma, too. You two are beautiful! Families sure bring out the best in you!